© 2012 Louise Levergneux. Manhole cover in Salt Lake City, Utah. I'm traveling to Austin, Texas, this week to work with another artist in the development of electronic interfaces for my next artist book with a working title of Surveillance. One of the specific things missing for me while traveling is the time to preoccupy myself over necessary details of a developing project. There is absolutely no time frame to be obsessive about anything on the road. Therefore, I’m looking forward to this interaction to stimulate me to re-create good studio habits and the passion for particular subject matters. Developing and realizing a creative idea, for me, usually takes a degree of obsession. I suppose most artists choose to be engaged with compelling and motivating ideas to the point of being enthusiastic. © 2018 Louise Levergneux. Manhole cover in Tucson, Arizona. © 2018 Louise Levergneux. 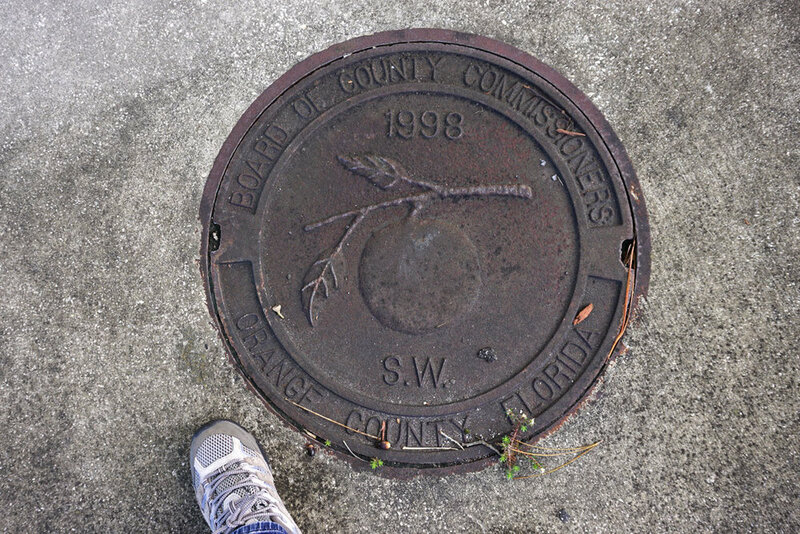 Manhole cover in Orlando, Florida. © 2019 Louise Levergneux. 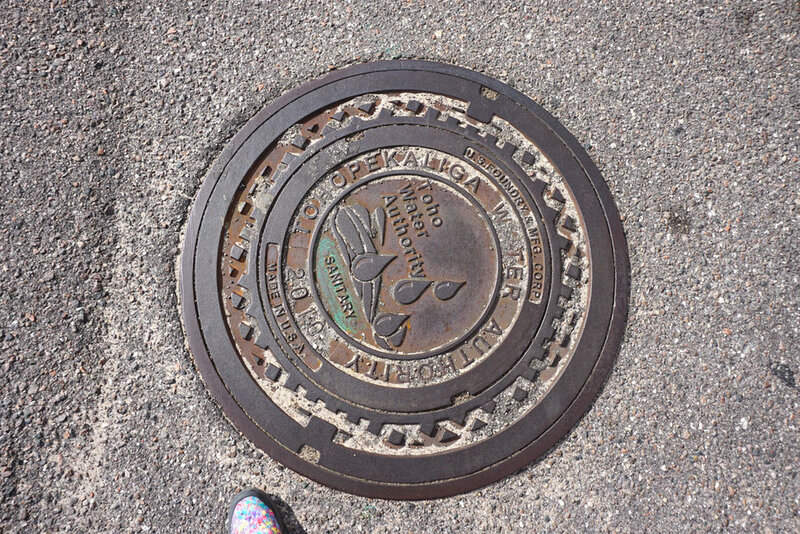 Manhole cover in St Petersburg, Florida. The allotted span of time it takes to wear the different hats (artist, creator, researcher, administrator, distributor...) does not leave much time for the creation — the fun part. However, I have not found the occasion to establish brief periods in my studio space and relate and connect to different subject matters. Traveling denies me the concentration time and fun of merely sitting in my space to reflect and work with my thoughts. Most of my time is taken by day-to-day activities of living and moving from one place to another. Traveling brings new ideas, but as a full-time traveler, shopping lists, balancing accounts, preparing meals, and... Life often takes over! © 2018 Louise Levergneux. Manhole cover in St Augustine, Florida. Yet, an idea might never leave your thoughts, and the obsession continues. Back in 1999, on a Scotland trip, when my project City Shields began, I collected many hundreds of images of manhole covers. I never thought 20 years later I would still be obsessed in photographing an interestingly designed manhole cover I happened to find during my walks. © 2018 Louise Levergneux. Manhole cover in Baton Rouge, Louisiana. © 2018 Louise Levergneux. Manhole cover in Circleville, Ohio. This might be a excellent example of a primal acquisitive urge — I built a whole project out of this creative fascination of photographing manhole covers. The collection continues, but the project came to an end when the jewel cases that contain the die-cut photos of manhole covers were no longer available. Being picky about how the project would be presented, I felt the need to maintain the same packaging because it was essential to the idea of City Shields. © 2018 Louise Levergneux. Manhole cover in Tulsa, Oklahoma. So, as I travel, I’m often caught searching the streets for the next beautiful manhole cover. The need to take the camera out and shoot yet another manhole cover cannot be denied! The obsession is still alive. What do I do with the multiple photos of manhole covers I’ve taken through my journey. Create an ebook, an on-demand book, an artists’ book...??? What obsesses me as an artist can enrich the viewer to interpret my work. How do I inject passion into my work while traveling? In a hectic lifestyle, through what force does one find time to create? By what means do I create a studio space to bring thoughts to completion? How does one balance the administration versus the creative side of art work? © 2017 Louise Levergneux. Manhole cover in Austin, Texas. © 2018 Louise Levergneux. Manhole cover in Sugar House, Salt Lake City, Utah. © 2012 Louise Levergneux. Manhole cover in Albuquerque, New Mexico.